The Best Shark Dive in the World! : Sharks and... Sharks! The Best Shark Dive in the World! 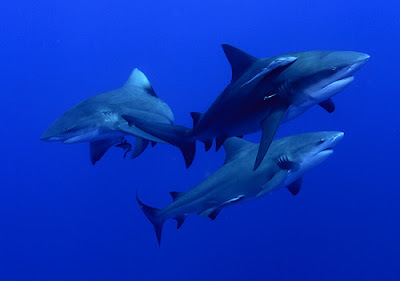 Blog about "The World's best Shark Dive" by Beqa Adventure Divers. Featuring up to eight regular species of Sharks and over 400 different species of fish, Shark diving doesn't get any better! Look no further than this scribe! Don't worry, I'm gonna spare you the corny "professional courtesy" jokes and the like - but I can confirm that the profession is conducive to a more, eh, relaxed attitude when interacting with the animals! Where is this leading, I hear you ask (with bated breath). Straight to Fiona Ayerst, Journalist, Attorney and Underwater Photographer extraordinaire - with a "special interest in Sharks"! As undoubtedly many a Blogger out there, I'm desperate for visual material which I harvest from the various websites at large. Specifically, I'm always on the hunt for Shark pics, many of which aren't properly labeled and all end up in a general "Shark JPEG" file for future use. One fabulous and hitherto anonymous set of terrific Bull Shark pictures has adorned several of my posts, like this one where it has even prompted an enthused comment by a reader. Like the picture on top, I now know them to be from this simply stunning portfolio by Fiona. And having snooped some more, I now know her to be a multi award-winning photo Champion! Check out this and her photo site: talk about being prolific and versatile! And on top of it all, she's also a Shark Conservationist, and involved in Bull Shark Research Projects, another amazing similarity! Very, I mean, Very impressive! Anyway, well done and Thank You for your commitment to the Cause! The ultimate Shark selfie ... easy in Fiji ! 15 Years of BAD Videos - Coming of Age! 15 years of BAD is awesome! The Video of Giant Isopods Eating an Alligator in the Deep Sea You Must Watch! Alas, it's gonna get Hot! "The Best Shark Dive in the World"